The newest version of Ford’s most powerful Mustang, the Shelby GT500, is yet to turn a wheel in anger, but that didn’t stop Ford from unveiling a convertible version at the Chicago Auto Show. Like the GT500 coupe, the convertible is a Mustang on steroids. The centerpiece is a 5.8 liter supercharged V8, producing 650 horsepower and 600 lb-ft of torque. That’s 100 more horsepower and 100 more lb-ft than the old version, which only had a piddling 5.4-liter engine. To match the engine’s immense power, Ford’s Special Vehicles Team added Brembo brakes with six-piston front calipers, and an optional Performance package with Bilstein adjustable dampers and a Torsen limited-slip differential. For would-be racers, the Track package adds coolers for the engine oil, transmission, and rear differential. On the outside, the GT500 convertible sports more aggressive front and rear fascias, unique wheels, and racing stripes right out of the ‘60s. The GT500 coupe has been making headlines because of its claimed 200 mph top speed, but Ford will limit the convertible to 155. Still, Ford told Motor Trend, the new car is nearly four seconds quicker around Sebring International Raceway than the one it replaces. Sebring is in Florida, where convertibles are very popular, so this is particularly useful information. Any Mustang’s natural competition is the Chevrolet Camaro, and at first glance the GT500 seems to have it outgunned. Chevy announced a convertible version of the ZL1, the most powerful Camaro, last October. That car only has 580 hp, courtesy of a detuned version of the Corvette ZR1’s 6.2 liter supercharged V8. However, the Camaro has a more sophisticated suspension system, the same magnetorheological system used on Corvettes and Cadillacs. The shock absorbers are filled with a metallic fluid that can be manipulated with magnetic current, allowing thousands of adjustments per second. This might give the ZL1 convertible an edge at Sebring, or any other track, even if the GT500 is the king of straight line speed. Pricing has not been announced, but expect the MSRP to be around the current car’s $53,810 base price. That may sound like a lot for a Mustang, but it’s very cheap for a car with 650 hp. The Corvette ZR1, the fastest and most expensive car GM makes, only has 638 hp; exotics like the Lamborghini Gallardo and Ferrari 458 can’t touch that number either. They can touch the GT500’s 155 mph top speed, though. Since no acceleration figures have been released, it’s hard to tell whether all that extra horsepower will be nothing but sound and fury, until someone figures out how to disable the speed limiter. 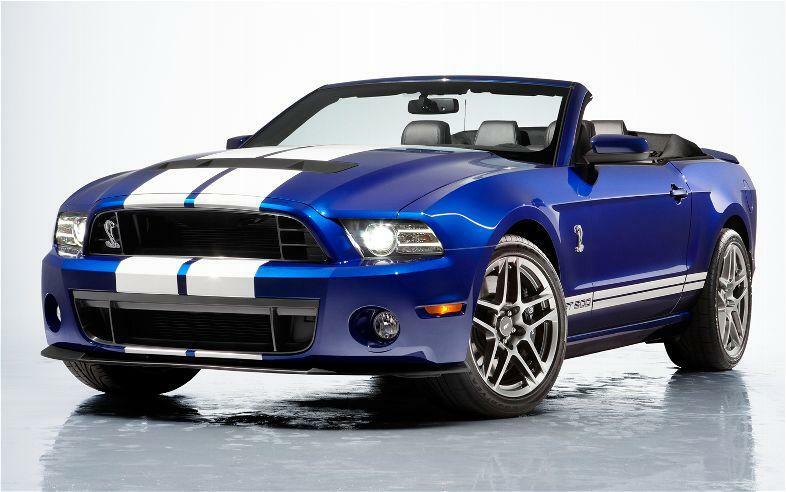 The unveiling of the GT500 convertible coincides with the 20th anniversary of the Special Vehicles Team. Since 1993, the group known as SVT has been Ford’s in-house tuner, a counterpart to Mercedes’ AMG and BMW’s M and maker of high-performance machines from the Raptor pickup to the GT supercar. Carroll Shelby, the legendary builder of the Cobra and the original Mustang GT500, may have his name on this new car, but SVT did most of the work. To commemorate the anniversary, the GT500 convertible sports illuminated doorsills with the SVT logo, because nothing says “high performance” like extra branding.